The powdered root of Devils Claw is a traditional African herbal remedy for the treatment of pain and inflammation. It is easy to take and is said to offer long lasting relief to those in need. Don't be scared off by its name – Devils Claw isn‘t diabolic at all. Devils Claw, also known as Harpagophytum, is named after the distinct hooked appearance of its fruit, which latch onto animals in order to disperse. Whilst its name sounds malevolent, the plant has actually been used as a traditional African medicine for centuries. Harpagophytum is native to the southern regions of Africa - with the highest abundance found in Namibia, and to a lesser extent in Botswana and South Africa. It was first brought to Europe and the western world in the early 1900's, where it was originally thought to improve digestion. Since its introduction into western culture, it has grown in popularity and been recognized for its medicinal value, which has been affirmed by scientific research. The principle effect Devils Claw is known for, is the reduction of pain and inflammation. It is used to relieve arthritis, back and neck pain, osteoarthritis and tendinitis. Whilst mainly seen as a traditional tribal remedy, its acceptance as an alternative treatment for pain related ailments is rising. It is an approved, over-the-counter drug in Germany, where it accounts for 74% of prescriptions for the treatment rheumatism. Secondary effects of Devils Claw are reported to help with gout, migraines, skin conditions (in the form of a salve), high cholesterol, fever and loss of appetite – although this is more anecdotal, with little research being conducted into these claims. 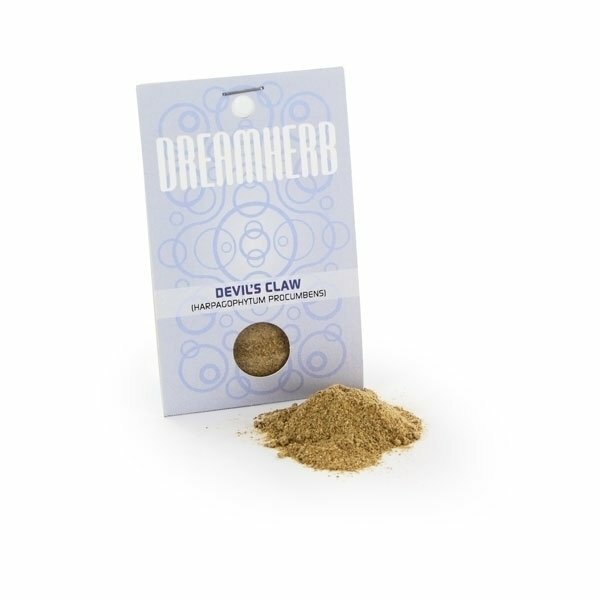 In its powdered form, Devils Claw can be taken with food, in capsules or tea. For the treatment of pain and inflammation, Devils Claw should be taken with food at a dosage of 50mg of harpagoside (the active ingredient of Devils Claw) per day. This could be either as part of the food, or in homemade capsules. Other ailments, such as appetite loss, are usually treated with a tea. To make this tea, place two teaspoons of powder in boiling water for 20 minutes, and then filter the mixture to remove plant matter and residue. Devils Claw contains iridoid glycosides, of which harpagoside is the most prevalent. This compound has been found to have anti-inflammatory and analgesic effects in laboratory tests. There are a few precautions to take with Devils Claw. In most cases it is harmless, but certain pre-existing conditions can cause complications. People suffering from stomach ulcers, duodenal ulcer, or gallstones should not use Devils Claw as it has been reported to occasionally interact negatively with the digestive system, potentially increasing stomach acid. Pregnant or breast-feeding women should abstain from taking Devils Claw, as there is not enough research into its effects on infants or unborn fetuses. It could possibly be unsafe and hurt the developing foetus. Devils Claw can potentially lower blood sugar, so diabetics should also take Devils Claw with prudence. Those with heart disease, or high or low blood pressure should also consider avoiding its use. Always check with your doctor first before taking any home remedy. We do not know Devils Claw to be illegal anywhere. It is your responsibility to double check – we cannot be held accountable if it is.